Do bars and squares count as cookies? I don’t know, I’ve always considered them the same. Okay, not exactly the same, but at least in the same family. Maybe in the same order. Perhaps even in the same genus, though probably not in the same species. In this particular instance, however, we appear to actually have some cross-speciation, since these are cookies AND bars at the same time. 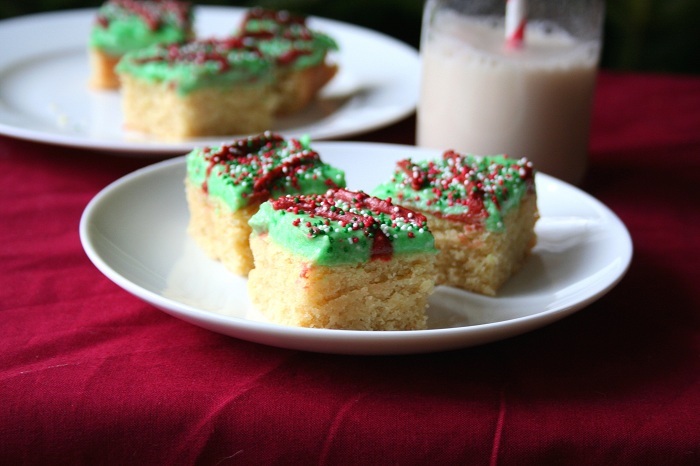 A bar and a cookie mated and gave rise to a whole new kind of offspring, the Sugar Cookie Bar. Sugari Cookiensis Barbarium, if you want the Latin name. Why yes, I am the world’s biggest dork. 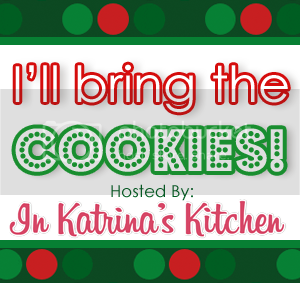 Surprising that my dear Katrina would even invite me to be a part of her I’ll Bring the Cookies, but she must have an affection for dorks. Gluten-free, low carb diabetic dorks, as it turns out. In case you’ve never been by my blog, All Day I Dream About Food, I have made quite a name for myself creating cookies and other treats using almond flour and my favourite natural sweeteners. I love nothing more than taking a traditional high-sugar, gluten-filled treat and seeing if I can recreate it. Usually it works. Sometimes it doesn’t. These cookie/bars were inspired by something I saw on the internet, I can hardly remember where. Probably Pinterest, or Facebook, or Foodgawker. Or all three. 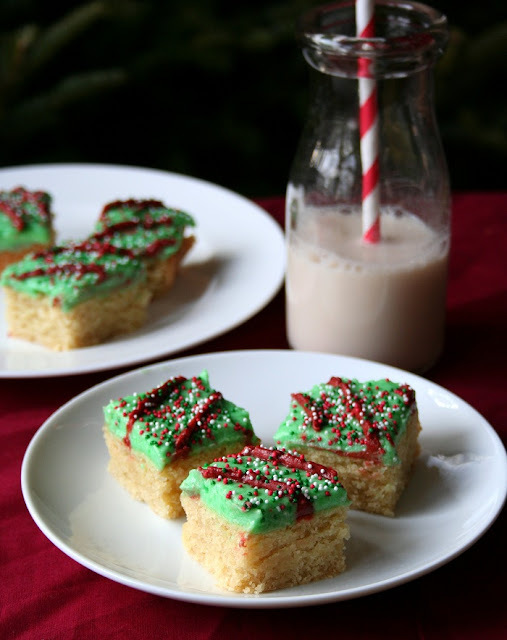 Sugar cookies are such a classic Christmas treat and forming them into bars makes them incredibly easy. No rolling, cutting or shaping. Just press into the pan, bake and you’re done. I have a great almond flour sugar cookie recipe (which doesn’t actually contain any sugar), and I was quite certain I could rework it to make it into bars. And should you happen to like your sugar cookies to actually contain sugar, you could use this same recipe and replace my sweetener. It’s all good. Preheat oven to 325F and line an 8 x 8 inch pan with parchment paper. In a medium bowl, whisk together almond flour, oat flour, baking powder and salt. In a large bowl, beat butter and erythritol or sugar until creamy. Beat in the eggs and vanilla extract, and then beat in almond flour mixture until dough comes together. Press dough firmly into prepared pan and smooth top with a flat-bottomed glass. Bake 30 minutes, until just golden brown around the edges and slightly more firm to the touch. Remove and let cool in pan. Beat together butter and powdered erythritol or sugar. Add cream, 1 tablespoon at a time, until desired consistency is achieved. Stir in vanilla and food coloring. Spread or pipe onto cooled bars. Thanks for bringing the LOW CARB and GLUTEN FREE (!!!) cookies, Carolyn! I was just wandering what the actually carb count was for these cookies? Also was wondering about the carb count, and how many servings does this make? Hi Katie. This was a guest post from Carolyn of All Day I Dream About Food. http://alldayidreamaboutfood.com/ You can pop her a quick email if you need help. Thanks! Is there anything I can use in place of the oat flour? I have coconut flour, almond flour, and carbquik? I think you’ll be making substitutions at your own risk as these types of recipes are pretty specific. Thanks for stopping by. is there a serving size? This recipe sounds pretty amazing. Thanks for featuring a gluten free cookie. Pinned to my “Christmas Cravings” board. I know making substitutions at your own risk, but I was curious what your thoughts are on using oat fiber in place of the oat flour? Can you even do that? I saw it used in your french toast and bought a large bag and am wondering what else I can use it with. 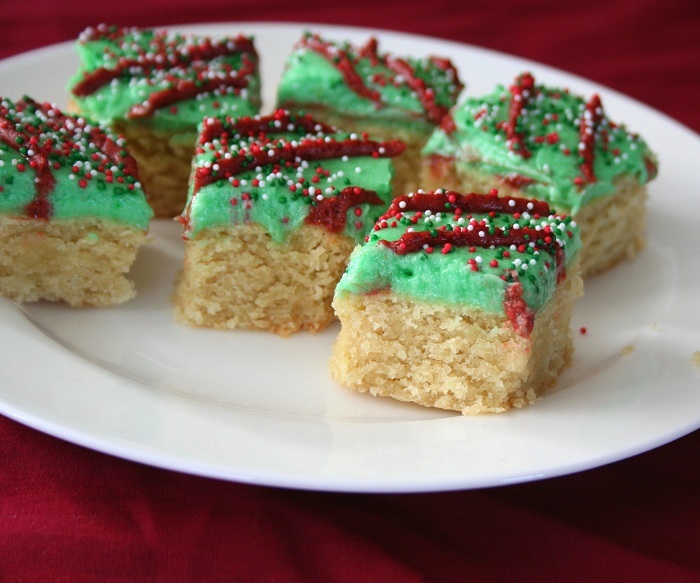 Do you think it could work in these cookie bars? These look so good! what should I substitute for almond extract for a nephew with nut allergies? Or just omit? What can I use in place of almond flour? I have a nut allergy.